Show Mix is the original fibre based conditioning feed designed to aid weight gain, promote extra condition and provide that show ring shine.Show Mix is a low starch feed, so energy is provided from slow release sources like fibre and oil to help avoid the behavioural problems that can be associated with high cereal feeds.Show Mix contains a blend of long fibre sources carefully hand selected from the finest quality straw, controlled levels of cooked cereals and vegetable protein sources. It also includes a concentrate pellet containing a broad spectrum vitamin and mineral supplement including important antioxidants (vitamin E & selenium), magnesium and key B vitamins. Pure unrefined soya oil is added to enhance coat bloom and gloss. 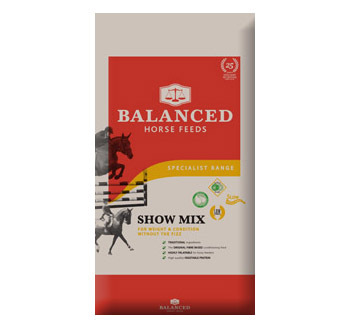 Show Mix is highly palatable for fussy feeders and is suitable for all types of horses and ponies in different degrees of work. When Show Mix is fed at the recommended levels no further supplementation is needed.